Schematic showing the effect of precipitation on pore geometry. The case without precipitation (a) is shown for comparison. 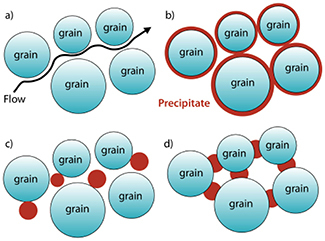 Precipitation may form on mineral grain edges (b), in large pores (c), or in small pores (d). Microphotographs of rocks (sandstones) showing pores, indicated with blue pixels, that are primarily (a) open and (b) clogged. 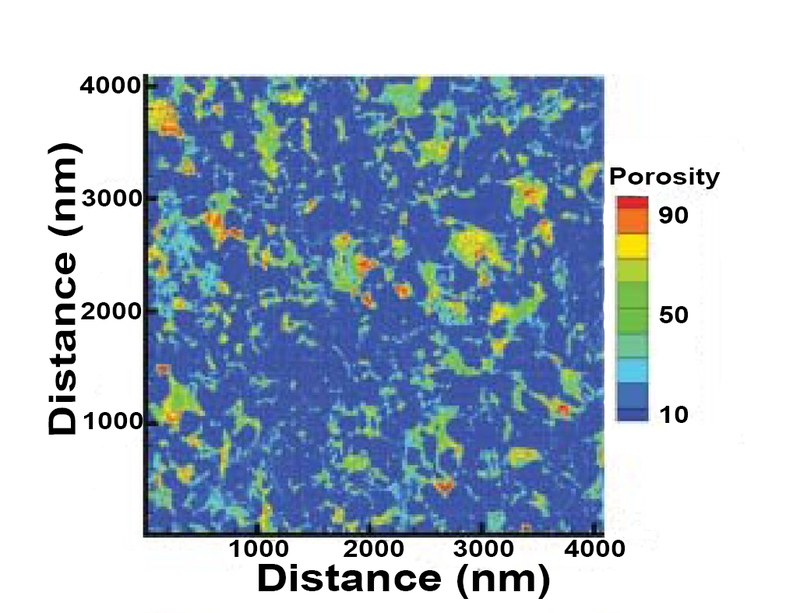 An example of a porosity distribution map made from a rock that is used in micro-continuum models of pore-scale flow. Rocks beneath Earth's surface are not completely solid but contain pores, like a sponge, and fractures, like a break in your bones, which allow fluids to move underground. Scientists at several of the nation's Energy Frontier Research Centers (EFRCs) are improving estimates of underground fluid motion in important societal situations such as extracting water and petroleum resources or storing nuclear and carbon dioxide waste. Their improvements may ensure, for example, that we can store enough carbon dioxide to curb our anthropogenic contribution to climate change. Subsurface flow predictions. To illustrate the challenge of making good travel predictions, imagine boarding a plane in Chicago expecting to be in San Diego 4 hours later. San Diego closes its airport because of bad weather, and you are diverted to Los Angeles where you rent a car and finish your journey. You arrive 8 instead of 4 hours after you board and you traveled through L.A., a city not even on your itinerary. In much the same way, changes to subsurface conditions alter the motion of traveling fluids, making it difficult to estimate the fluid trajectory. Geochemical processes occurring inside and around the rock pores cause those changes in subsurface conditions, according to Carl Steefel and Lawrence Anovitz, from the Center for Nanoscale Controls on Geologic CO2 (NCGC). In a special volume of Reviews in Mineralogy and Geochemistry, Steefel, Anovitz, and their colleagues from their EFRC and the Center for Frontiers of Subsurface Energy Security (CFSES) and the Center for Geologic Storage of CO2 (GSCO2) discuss the unique physics and chemistry occurring at the scale of the rock pores that directly controls larger-scale phenomena in rocks including fluid flow. For example, fluids moving through pore networks can either dissolve or deposit (through precipitation) minerals within pores, according to Andrew Stack of NCGC. If minerals precipitate, illustrated here in the top figure, they may eventually clog a pore and force the already moving fluid to re-route, much like the rerouted flight. Alternatively, the precipitated minerals may quickly dissolve, simply causing minor travel delays. Understanding when to expect travel delays or a full-on itinerary change is a challenge. Stack notes that there are three models—which completely contradict each other—of how precipitation proceeds. What does it mean to have three separate and contradictory models for the same process? To return to the illustrative example, while one model may correctly predict you end up in San Diego, it may incorrectly estimate that you arrive after 6 instead of 8 hours. Another model may estimate your 8-hour travel duration but re-route you through Phoenix instead of L.A.
Why isn't one model the best? To answer that, take a look at what the models describe. Subsurface flow processes. Pore spaces have complicated geometries. As NCGC's Anovitz notes in his review co-authored with David Cole, pore sizes can span nanometers to meters, over 8 orders of magnitude! Experimental methods, such as small and ultra-small angle neutron and X-ray scattering, are now aiding scientists in characterizing pore size and shape in rocks in the nano- to micrometer length scales. Differences in pore geometry within a rock or among types of rocks can result in different interactions between the solids forming in the pores and fluids traveling through them. Fluids and the walls of the pores can also have varying chemical composition that may alter how dissolution or precipitation proceeds within a pore, or stops it altogether. This dissolution-precipitation, in turn, influences the transport of the fluids in a complicated feedback process. Returning to our air travel example, stormy weather introduces a similar type of complexity into air travel. The effects of storms on travel are different every time you fly like the effect of pore-scale geochemical processes is different for different systems and/or conditions. Unlike the air travel example, however, storms are the norm, underground. One model for underground fluid flow cannot reliably predict all of the possible scenarios, thus there is not one that is the "best." Each model will be more accurate for some scenarios and less accurate for others. Fluid travel alteration or even cancellation can have negative consequences. For example, if pores clog too quickly in the case of carbon dioxide storage, only 5 percent of the available space in a given rock may fill with carbon dioxide. Unless we can use closer to 95 percent of the pore space, a particular research objective of CFSES, we may be unable to store enough carbon dioxide to curb our anthropogenic contribution. Clogging, shown in the second figure, is likely to occur with highly reactive fluids that move through intricate pore networks, according to researchers at CFSES and GSCO2. To accurately model clog-forming conditions, models may need to include the effects of chemical reaction rates that vary at different fluid-solid interfaces. Including these effects is not straightforward as an average or bulk reaction rate is unlikely to represent the effects well. Direct numerical simulations of pore-scale flow can account for such spatial variability in reaction rates. An added benefit of these models is their ability to perform well at the much larger scales on which fluid flow needs to be managed, a particular goal for NCGC. Returning to our air travel example, storm systems rolling across the Midwest affect individual cities differently, making it difficult to estimate a common delay time for all flights. Additional modeling approaches used to make pore-scale flow estimates include micro-continuum approaches by NCGC and hybrid approaches by CFSES. Both approaches describe flow through a network of pores that is governed by properties such as the amount of open space in the rock and the ability of the solid to let fluid pass through it. These parameters may be estimated using images of rocks (see the third figure), in the case of micro-continuum models, or computed with smaller-scale models, in the case of hybrid models. The former approach is like using the "estimated on-time arrival," computed using past on-time arrival data, to select your flight. And the latter may involve considering "estimated on-time arrival" that considers an airport's history for significant delays because of bad weather. And these high-resolution imaging and modeling approaches provide much more complete descriptions of the conditions along the fluid travel paths, akin to a detailed weather map for the pilot. Predicting subsurface fluid flow during storage and extraction is as tricky as air travel during stormy weather. Individually, the contributions of EFRC scientists identify which situations lead to fluid travel delays, re-routes, and cancellations. Collectively, their work demonstrates something much larger. The pore scale is not a smaller version of the physics happening at larger scales, and if it's not included in models, they will be unable to generate reliable predictions. And that finding may ultimately pay off in the form of environmental security for future generations. Anovitz and Cole. 2015. This work was funded by the U.S. Department of Energy (DOE), Office of Science, Office of Basic Energy Sciences (BES), Division of Chemical Sciences, Geosciences, and Biosciences through the Nanoscale Control of Geologic CO2 EFRC. We acknowledge the support of the National Institute of Standards and Technology, Center for Neutron Research, U.S. Department of Commerce, which is supported in part by the National Science Foundation; the High-Flux Isotope Reactor at the Oak Ridge National Laboratory, sponsored by the Scientific User Facilities Division, DOE Office of Science, BES; the Manuel Lujan, Jr. Neutron Scattering Center at Los Alamos National Laboratory, which is funded by DOE's Office of Science, BES. Los Alamos National Laboratory is operated by Los Alamos National Security LLC under DOE contract; the Advanced Photon Source, a DOE Office of Science User Facility operated for the DOE Office of Science by Argonne National Laboratory; the Hoger Onderwijs Reactor, Delft University of Technology, The Netherlands, and the JCNS at the Forschungs-Neutronenquelle Heinz Maier-Leibnitz, Garching, Germany, in providing the X-ray and neutron research facilities used in this work. Mehmani and Balhoff. 2015. This material is based upon work supported as part of the Center for Frontiers of Subsurface Energy Security, an EFRC funded by the DOE, Office of Science, BES. Molins 2015. This material is based upon work supported as part of the Center for Nanoscale Control of Geologic CO2, an EFRC funded by the DOE, Office of Science, BES. Stack 2015. Research on carbon dioxide sequestration was sponsored by the Center for Nanoscale Control of Geologic CO2, an EFRC funded by the DOE, Office of Science, BES. Research on barite and metal contaminants was supported by the DOE, Office of Science, BES, Chemical Sciences, Geosciences, and Biosciences Division. Steefel et al. 2015. This work was supported as part of the Center for Nanoscale Control of Geologic CO2, an EFRC funded by the DOE, Office of Science, BES. This work was also supported in part by the Director, DOE, Office of Science, BES, Chemical Sciences, Geosciences, and Biosciences Division under the same contract. Yoon et al. 2015. Work by HY on the entire manuscript was supported as part of the Center for Frontiers of Subsurface Energy Security, an EFRC funded by the DOE, Office of Science, BES. Sandia National Laboratories is a multi-program laboratory managed and operated by Sandia Corporation, a wholly owned subsidiary of Lockheed Martin Corporation, for the DOE's National Nuclear Security Administration. QK acknowledges Los Alamos National Laboratory's Laboratory Directed Research and Development Program and Institutional Computing Program. AJV acknowledges support for biofilm applications from the DOE Subsurface Biogeochemistry Research Program. Additional work by AJV on mineral precipitation applications was supported as part of the Center for Geologic Storage of CO2, an EFRC funded by the DOE, Office of Science, BES. Kirsten Chojnicki is a postdoctoral appointee in Geomechanics at Sandia National Laboratories and a member of the Center for Frontiers of Subsurface Energy Security. She is an experimental geophysicist, specializing in the mechanics of geologic fluid flows. She has an M.S. and Ph.D. in geology from Arizona State University and a B.S. in earth and space sciences from the University of Washington. Before joining Sandia, she was a Scripps Postdoctoral Fellow in Geophysics and Planetary Physics at the Scripps Institution of Oceanography at the University of California, San Diego.